Fortune Frenzy Casino will then reward you with a bonus (Welcome Bonus is for new players only). The terms and conditions of the bonuses vary between different casinos and might also change over time and between different countries, so it is important to compare the different offers and read the T&C for Fortune Frenzy Casino before signing up. 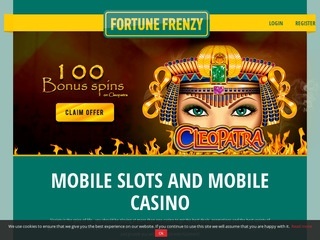 Fortune Frenzy Casino is a Nektan powered casino that focuses on mobile casino players who need their casino account and favorite games to be accessible at all times, regardless of the time and place. This is exactly what they will get with Fortune Frenzy, an instant play casino that you can launch directly from your browser on any device – smartphone, tablet or PC. The casino is licensed by Gibraltar and UK Gambling Commission, the latter being the legal body which regulates the casino’s GB market and protects the interests of their UK based clientele. 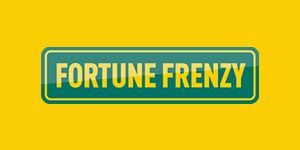 Apart from reliable regulatory bodies, Fortune Frenzy can also offer a rich promotional program which starts with the bonus cash and no-deposit Free Spins welcome wagon for the newly registered members. The site itself features a simple layout with bright green and yellow background; you will find that the platform is quite user-friendly and easy to manage, from the gaming filters to the registration forms and customer support options, including the Live Chat button located both at the top and on the bottom of the page. The list of the software developers whose games are presented in Fortune Frenzy casino is quite lengthy and includes some of the top industry names – Microgaming, Evolution, NetEnt, NextGen, NYX, IGT, Red Tiger… The casino allows the registered members and visitors to filter the games using the list of the providers located on the left side of the screen, although other pointers can be utilized as well – category, type, and win frequency. Most of the games can be played without even creating an account or submitting your first deposit – we are, of course, talking about the demo version and real money mode can only be played by those who completed the registration process. Fortune Frenzy Casino sorts their games according to Jackpot type, popularity, date of release, wins, etc. Slots make the majority of the offer and can, therefore, be found under more than just one category. Jackpots, for example, is where you can trace all the games that have progressive payouts, including legendary Mega Moolah, Cleopatra and Divine Fortune. New Games section is where all the latest launches can be located – most of them being slot games – and if you would like to see what the general public and Fortune Frenzy recommend as the hottest, just click on the Hot Flag section and games with the largest volume of traffic will pop up. Even the volatility can be filtered and the players have the option of only playing the games with the highest or most frequent payouts, depending on the selected tags. This category merges the Casino games and Fortune Frenzy Casino Live Dealer offer, although both of these categories are available separately. The offer here is quite traditional: Hi Lo and European Blackjack, Perfect Pairs and 21+3 side bets variants, Poker, Roulette and Punto Banco. A separate category with Keno, Bingo and Scratchcards does not exist in Fortune Frenzy, but some of the mentioned games can be found using the search bar. Scratch Oil Mania, Scratch Medusa, Scratch Foxin’ Wins, Bingo Billions and similar games are scattered across the casino categories but they do exist and you can find them with just a little bit of patience and the right keyword. Live Tables are streamed from Evolution studios and the operator also included the developer’s Football Studio offer, which, just like the rest of the live dealer games, can only be accessed by the players with an active account. There are more than 20 Roulette, Blackjack, Baccarat and Poker variants, available on standard and VIP tables. The minimum deposit entry is set at £10, although some of the payment methods will raise the limit and members who opt for Boku will have to cover the 15% fee, deducted from the deposit. To fund their casino account, players can also use VISA, MasterCard, Neteller, Paysafecard, and Skrill. The withdrawals can be made once a day, with £20 as the minimum amount that can be pulled out. The daily maximum is £2,000 and the requested amount is immediately deducted from your casino balance and settled on your private e-wallet or bank account once the casino processes the withdrawal requests. The pending period can last up to 72 hours and after that, the money usually settles in up to 5 business days. Fortune Frenzy FAQ section does a pretty good job at providing the answers to all the questions that you could possibly have, but if you need an additional explanation, the casino representatives can be reached via phone, email or Live Chat. The email replies can be expected in no more than 24 hours, while Live Chat and phone support services are available every day from 8.00am to midnight BST.